The Affiliate CSCS Card is a Card provided by an existing UK building industry accrediting body, which has been affiliated with the CSCS Card. Effectively the Affiliate CSCS Card is the CSCS Card for trades and roles covered by the affiliating bodies. Like a CSCS Card, it provides proof that the holder has a measurable standard of competence in his or her trade: and that he or she has passed a CSCS Health, Safety & Environment Test. Your Affiliate CSCS Card will have the following things on the front: a current photograph of you; your full name; your registration number with the affiliate body in question; and a CSCS hologram logo. The holographic CSCS logo shows that you have passed a CSCS Health, Safety & Environment Test or equivalent test for your trade. The back of your Affiliate CSCS Card will usually be endorsed with the qualification route you have taken to achieve your current position in the industry. Individual Affiliate CSCS Cards differ slightly in their appearance and the things they have listed on them. The above is a basic list of usual Card features. Why Do You Need an Affiliate CSCS Card? Affiliate CSCS Cards are proof to your employer or site owner that you have the competence, skill and health and safety qualifications necessary to perform your role. Most UK building sites now enforce a strict “No CSCS Card, No Work” policy. In trades where the Affiliate CSCS Card takes the place of a CSCS Card, the same rule applies. If you want to get the role you want and the remuneration you deserve, you need an Affiliate CSCS Card. Each Affiliate CSCS Card follows a colour coding scheme similar to that used by the CSCS Card. A Red Affiliate CSCS Card indicates a Card holder who has enrolled in, but not yet passed, the relevant Construction NVQ. A Green Affiliate CSCS Card indicates a holder who has basic site skills only (like a labourer). A Blue Affiliate CSCS Card indicates a holder who has a Construction NVQ Level 2. A Gold Affiliate CSCS Card indicates a holder who has a Construction NVQ Level 3. Construction NVQ Levels 4 and higher equate to a Managerial or Supervisory Affiliate CSCS Card. 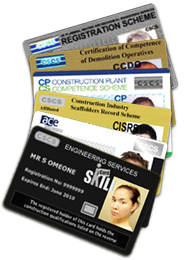 There are minor variations between the colour coding of some Affiliate CSCS Cards and the normal CSCS Card colour scheme. In order to qualify for an Affiliate CSCS Card, you will need to have the correct Construction NVQ Level in the appropriate trade. You’ll also need to pass a CSCS Health, Safety and Environment Test. Construction Support Line has extensive experience in arranging Affiliate CSCS Card applications. We’ve helped thousand of UK construction workers to get their Affiliate Cards. Apply for the card you need online or give one of our friendly team a call on 0203 051 1004.
or 0203 051 1004 if you are on a mobile, Mon-Fri between 8am to 8pm. The Construction Support Line client area makes contacting us, checking orders and viewing personal details easier than ever before for existing customers.